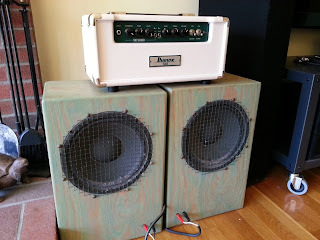 My new amp came this week. It's a Ibanez TSA15H, a 15-watt tube amp with a "tube screamer" distortion circuit built-in. Wired up to my speakers it sounds really great, particularly the clean sounds - lots of dynamics. With the tube screamer section on, it also sounds pretty nice, perhaps a bit better than the GSP2101. The bad news is that the effects loop isn't what I expected. In most amps, the effects loop is at line level, between the pre-amp and the power amp. In the TSA15H, it's between the tube screamer section (which is actually has no tubes), and the tube pre-amp, so it's at the low-level of the instrument. This means I can't really use the digital section of my GSP2010 in the Ibanez's effects loop. Since the Send of the Ibanez is at instrument level (and/or impedance?) I have to plug it into the pre-amp section of the GSP2101 (AKA the instrument input). The line-level output of the GSP2101 goes the the Return on the Ibanez, and seems ok if I turn the output level of the 2101 way down. In theory, I could set up some GSP2101 patches with a flat EQ, no distortion, etc. But really, the whole idea of getting the Ibanez was to have a simpler, less technical setup that sounds like a more typical guitar amp. Probably just a simple delay or reverb stomp box will fill it out. 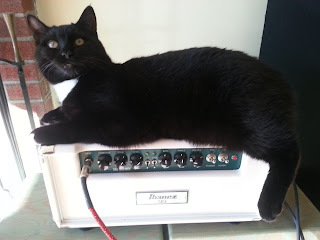 Sparkles is a big tube amp fan. He loves the warm sound. Well, really he just likes the warm spot.